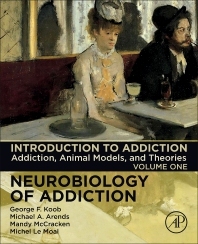 Introduction to Addiction, Volume One in the series, introduces the reader to the study of neurobiology of addiction by clearly defining addiction and its neuroadaptational views. This volume includes thorough descriptions of the various animal models applicable to the study of addiction, including Animal Models of the Binge-Intoxication Stage of the Addiction Cycle and Animal Models of Vulnerability to Addiction. The book's authors also include a section on numerous neurobiological theories that aid in the understanding of addiction, including dopamine, prefrontal cortex and relapse. Dr. Koob is an internationally-recognized expert on alcohol and stress, and the neurobiology of alcohol and drug addiction. He is the Director of the National Institute on Alcohol Abuse and Alcoholism (NIAAA), overseeing a broad portfolio of alcohol research ranging from basic science to epidemiology, diagnostics, prevention, and treatment. Dr. Koob earned his doctorate in Behavioral Physiology from Johns Hopkins University in 1972. Prior to taking the helm at NIAAA, he served as Professor and Chair of the Scripps’ Committee on the Neurobiology of Addictive Disorders and Director of the Alcohol Research Center at the Scripps Research Institute. Early in his career, Dr. Koob conducted research in the Department of Neurophysiology at the Walter Reed Army Institute of Research and in the Arthur Vining Davis Center for Behavioral Neurobiology at the Salk Institute for Biological Studies. He was a post-doctoral fellow in the Department of Experimental Psychology and the MRC Neuropharmacology Unit at the University of Cambridge. Dr. Koob began his career investigating the neurobiology of emotion, particularly how the brain processes reward and stress. He subsequently applied basic research on emotions, including on the anatomical and neurochemical underpinnings of emotional function, to alcohol and drug addiction, significantly broadening knowledge of the adaptations within reward and stress neurocircuits that lead to addiction. Dr. Koob has authored more than 650 peer-reviewed scientific papers and is a co-author of The Neurobiology of Addiction. Dr. McCracken is a senior post-doctoral fellow at the National Institute on Drug Abuse in Bethesda, Maryland. She graduated with Honors in Biology and Psychology from The University of Texas at Austin and then earned a Ph. D. in Pharmacology and Toxicology at the College of Pharmacy at The University of Texas at Austin. Her research interests focus on molecular neurobiological mechanisms involved in neuroadaptations to drugs of abuse including opioids and alcohol. She has identified key sites on GABA-A receptors and glycine receptors important for the neuronal actions of alcohol. She has extensive experience in teaching as an Assistant Instructor with Dr. R. Adron Harris for the course Neurobiology of Addiction at The University of Texas at Austin. Michel Le Moal, is Professor Emeritus of Neuroscience at the University of Bordeaux, France. He graduated in Medicine (1962) in Philosophy-Sociology and Natural Science and then Neurology (1967) and Psychiatry (1968). He completed a Doctoral in Science at the University of Bordeaux in 1974. In parallel with his academic life in Bordeaux, he spent time as an Associate Researcher and Professor at Caltech (1974) and at The Salk Institute and The Scripps Research Institute. At both institutions, he worked on dopamine neuron electrophysiology and investigated the roles of brain CRF and dopamine systems in behavior and drug addiction. He research interests concern behavior and adaptive processes, their biological foundations, and experimental psychopathology, a discipline he promoted. The concept of individual vulnerability to behavioral pathologies has been at the center of his working hypothesis. Dr. Le Moal has been the founder and director of several research laboratories at the Centre National de la Recherche Scientifique (CNRS) and Institut National de la Sante et de la Recherche Medicale and finally the Magendie Institute for Neuroscience and Biological Psychiatry in Bordeaux, France. He is an elected Fellow of the French National Academy of Sciences.